10 Helpful phrases to say after miscarriage in addition to other practical advice about what to do and what to avoid after a friend has a miscarriage. “BEN, I’M LOSING THE BABY!” I screamed in frantic desperation. I wanted him to come rescue me, to somehow stop this nightmare from happening. But all he could do was call the doctor and cry with me. I had only known I was pregnant for six days. And it was already coming to an end. In those six days my husband and I had discussed names. We wondered if our baby was going to be a boy or a girl. We already had hopes and dreams for our baby’s future. We told our two-year-old that he was going to be a big brother. We imagined them playing together. I had been so happy to be pregnant again. In the days and weeks that followed my miscarriage I had many kind friends and family members offer comforting words and selfless service. But there were also many who were insensitive and dismissed my miscarriage as “no big deal” because it happened so early. It was a big deal to me. I lost a child. I was devastated. Two more babies and five years have healed my heart. I have even grown grateful for this experience because it taught me about empathy. It taught me compassion. And now when I have a friend who has a miscarriage, no matter at what point of the pregnancy it happens, I know what to say. I know what to do. The most important thing is to listen. Cry with your friend. Put your arm around her. Bring her a coffee or her favorite treat. Everybody needs a listening ear and a loving hand. Nobody needs unsolicited advice or stories about somebody else who has suffered. Don’t tell a story that you think is way worse in an effort to make your friend feel better. Nobody feels better knowing someone else has suffered. Don’t go on and on about your own miscarriage(s). This is about her, not you. Follow her cues. If she asks you questions about your own miscarriage, of course answer them, but don’t focus the conversation on yourself. This is her time to mourn and your time to comfort. Don’t avoid your friend just because you don’t know what to say or do. Do or say something from the list above. If you are uncomfortable with a face-to-face conversation send a card or a text. Even the smallest act of support can make a big difference. My best friend of 25 years called from a neighboring state when she heard the news. I missed the call, so she left a heartfelt voicemail. She could hardly talk, she was so overcome with grief for me. I could feel her love and her support from hundreds of miles away. I think all she said between her own tears was, “Hi, Crystal, I’m so sorry for your loss. I love you.” She probably hung up and wondered if that was enough. I’m here to tell you that it was. More than enough. I saved that message and listened to it over and over again throughout the following weeks. She knew exactly what to do and say after miscarriage. Your friend will feel that, too. Listen. Be genuine. Be present. Be loving. When a woman miscarries there is a man in the background who has lost a child, too. Be sensitive to Dad as well. Talking about miscarriage among men is a huge taboo in our culture. The men who go through it are left without much support. I can tell you that dads need help and support, too. My husband was just as sad about our loss as I was. He felt powerless to help me. This was a problem he couldn’t fix and it left him feeling lonely and heartbroken. And even though he didn’t have to go through what I did physically, it was emotionally taxing on him. He mourned just as I did without the benefit of any support from friends or family who had been through it, too. I would love to see dads rise up to support each other through loss. A phone call, a simple text expressing condolences, a private email, Facebook message, or tweet would go a long way to help dads feel loved and supported through their grief. Remember, doing and saying nothing gives the impression that you don’t care. Use the helpful phrases and suggestions above to offer help and support and to know what to say after miscarriage. Thank you for giving me a list of ok things to do and say. A good post. My husband mourned with me when we experienced miscarriage, and he felt the pain of loss and heartbreak. So he turned around and made sure to send a message of comfort to other friends who’s wives had had a pregnancy terminate early. I’m glad you mentioned that. That’s really admirable that he did that. Reaching out to others who have been through the same thing is not only kind, it’s also healing for both parties. Thank you so much for sharing. Such an important post. 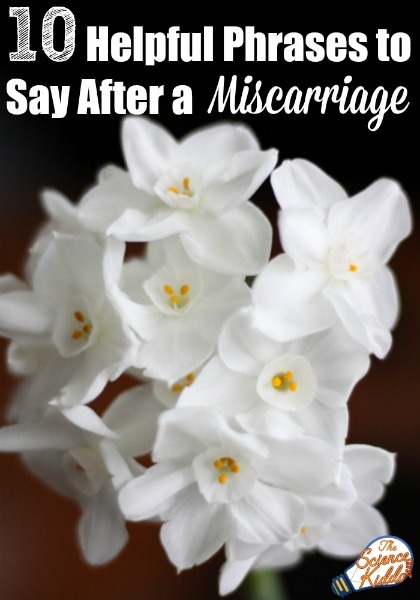 Miscarriage is so common, and I’m happy it’s a topic our culture is finally starting to broach… but people are often stymied when it comes to saying the right thing. I think your list is right on. Thanks for sharing.